The old warhorse Il trovatore may not have come out of fashion lately, but it was quite some time since I had a recording for review. The last time, as far as I remember, was a reissue of the Acanta LPs – actually a sound track recording for a German film in the 1970s – with the thrilling Franco Bonisolli as Manrico some four years ago. I put the present recording on my request list for pure curiosity. I knew the conductor – a regular at the Arena di Verona for many years – and Enkelejda Shkosa, the Azucena in the performance. The rest of the singers were totally unknown for me, and my expectations were – to put it mildly – not very high. How wrong I was! This opera has, in many productions, been bawled to pieces by insensitive mediocre singers, who mistake thrill with volume. Not so here. In fact I was initially almost bowled over by the sensitiveness of the singing. Not everything was completely to my taste. And let me elucidate at once what wasn’t to my taste. Recorded live it is unavoidable that there are distracting noises. Since there is also a DVD version available, readers who want to know the source for these disturbances probably should opt for that version. In the theatre or in front of my TV screen I am much more tolerant to noises, when I know from where they come. In several places the disturbances are actually extremely marked. My wife reacted strongly. The applause may also be an irritant – especially for repeated listening. The chorus is not entirely homogenous. There are some quite strident female voices that stick out. On the other hand the set pieces – the anvil chorus and the soldiers’ chorus – are well executed with brisk tempos and rhythmic lilt. 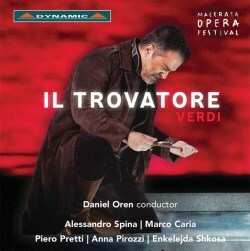 Daniel Oren, who has conducted at the Arena di Verona every year since his debut there in 1984 – and is now the one who has conducted more performances there than anyone else – knows his Trovatore, and this is a thoroughly idiomatic reading of the work. One feels safe when listening to this performance. The recorded balance is a satisfying as can be expected from an open-air arena. As I have already intimated the big surprise was the singing. The Albanian mezzo-soprano Enkelejda Shkosa initially felt like a drawback through her very prominent vibrato, at times bordering on a wobble, but I soon accepted it and her deep involvement and dramatic intensity definitely won me over. There is both warmth and sorrow in her voice. Alessandro Spina is an expressive Ferrando, steady and with springy rhythms. The rivalling brothers are also attractive, even though both are arguably a size too small for their roles. Marco Caria as Il Conte di Luna has a manly baritone voice, steady, warm and sings his aria, Il balen in the second act, with a good legato and his cabaletta is quite good. Even more impressive is Piero Pretti’s Manrico. One associates the role with big-voiced, leather-lunged singers like Del Monaco, Corelli and the aforementioned Bonisolli, but singers like Björling and Bergonzi have shown that a more lyrical approach can be just as telling, and Pretti manages quite well with the same basic approach. His off-stage serenade in the first act may not be as lyrically apt as one would ideally wish, but the long scene with Azucena in the second act is quite successful – and he nuances well. In the third act he sings Ah! Si ben mio carefully and tastefully and he has the measure for Di quella pira and the unauthentic high C, which rings out impressively – though the tone is slightly pinched. He is also brilliant in the last act – in particular in the final duo with Leonora. But it is Anna Pirozzi in that role who is the real star of the performance. She shows her credentials in the first act aria Tacea la notte with brilliant spinto tones and exquisite pianissimos, reminding me of Zinka Milanov who was one of the great Leonoras. She is even better in the last act, where she dominates the proceedings superbly. D’amor sull’ali rosee is magical and in the duet with Luna she is great. This is definitely a soprano to watch in the future. The longstanding favourites among recordings of this opera – Cellini with Milanov and Björling, Serafin with Stella and Bergonzi and Mehta with Price and Domingo – still hold their own, but this latest offering also has a lot to offer, in particular Anna Pirozzi’s Leonora.